Hi. Thanks for reading my post. I have big problems, so please help me get rid of them. I've attached my logs and copied and pasted my SuperAntispyware Report. I see Rorschach112 helped you before, lets take a look at things again. Post the logs unless instructed to post in another manner. Refrain from attaching, it makes things difficult to read at times. I am closing your other open thread. Is ozzette a reference to Ozzy? Sorry for the double post. It was accidental. I don't know how it happened, I was angry, that explains it. So many popups. And of course my ozzette handle pays homage to Ozzy! Please find the requested logs below. "2008-03-03 17:57:54 C:\WINDOWS\Tasks\Norton SystemWorks One Button Checkup.job"
WARNING: FixIEDef will kill all copies of Internet Explorer and Explorer that are running, during removal of malicious files. 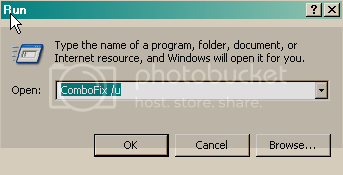 The icons and Start Menu on your Desktop will not be visible while FixIEDef is removing malicious files. This is necessary to remove parts of the infection that would otherwise not be removed. Post the FixIEDef log file, located on the Desktop. Note: process.exe is detected by some antivirus programs (AntiVir, Dr.Web, Kaspersky) as a "RiskTool". It is not a virus, but a program used to stop system processes. Antivirus programs cannot distinguish between "good" and "malicious" use of such programs, therefore they may alert the user. Hey Harry. Here are the latest logs you asked for. I didn't run a fix in that win thing, because I wasn't sure how. Besides, you didn't say to run the fix, so I didn't worry about it. Sorry for the delay, gotta work sometimes. Lets unload Bit torrent for now, its got some things open. Uninstall it and we will remove the leftovers. I am going through your WinPFind35u log now, takes a bit of time. Hi. I didn't know whether you needed me to acknowledge or not, so I just letting you know that I got rid of the torrent program and will check again tomorrow before work. Thanks Harry! Before I make anymore changes on your machine, I need to know when this problem started. What did you download or change on the date 2/21/2008? run the superantispyware again and post a fresh log from it please. Hi. All I did when this started was download a game from Adventure Game Studio and use a walkthrough from the forum. I never have had any problems with the games at this site, but this time something went horribly wrong. After I finished the game, I had a popup about Web buyer or something like that was installed. I uninstalled it, but the popups after that were crazy. It would open so many browsers just sitting that it would reboot (I guess that is what happened). I ran the routine and it didn't help, but what you have done so far has stopped the popups. I have deleted the game and will never reload it or go to that new walkthrough page that's in the forums again. I hope you can finish it up. Here is the log you requested. Harry, sorry but it said my post was too long. I have attached it. If you want it in any other form, just let me know, OK? Ok. It says the file is too large to attach. I am going to split it in 2 and make 2 posts. I will then make 2 attachments as well. I don't know what else to do. I hope you can work with something. Thanks. Ok, now it says that part 2 is too large to post. So I will make 3 posts. However, the attachment is part 2 in it's entirety. Thanks. I hope I am doing ok.